Determine the maximum speed of an oscillating system. In the case of undamped simple harmonic motion, the energy oscillates back and forth between kinetic and potential, going completely from one to the other as the system oscillates. So for the simple example of an object on a frictionless surface attached to a spring, as shown again in Figure 1, the motion starts with all of the energy stored in the spring. As the object starts to move, the elastic potential energy is converted to kinetic energy, becoming entirely kinetic energy at the equilibrium position. It is then converted back into elastic potential energy by the spring, the velocity becomes zero when the kinetic energy is completely converted, and so on. This concept provides extra insight here and in later applications of simple harmonic motion, such as alternating current circuits. Figure 1. The transformation of energy in simple harmonic motion is illustrated for an object attached to a spring on a frictionless surface. From this expression, we see that the velocity is a maximum at as stated earlier in Notice that the maximum velocity depends on three factors. Maximum velocity is directly proportional to amplitude. As you might guess, the greater the maximum displacement the greater the maximum velocity. Maximum velocity is also greater for stiffer systems, because they exert greater force for the same displacement. This observation is seen in the expression for it is proportional to the square root of the force constant Finally, the maximum velocity is smaller for objects that have larger masses, because the maximum velocity is inversely proportional to the square root of For a given force, objects that have large masses accelerate more slowly. Suppose that a car is 900 kg and has a suspension system that has a force constant The car hits a bump and bounces with an amplitude of 0.100 m. What is its maximum vertical velocity if you assume no damping occurs? We can use the expression for given in to determine the maximum vertical velocity. The variables and are given in the problem statement, and the maximum displacement is 0.100 m.
This answer seems reasonable for a bouncing car. There are other ways to use conservation of energy to find We could use it directly, as was done in the example featured in Chapter 16.1 Hooke’s Law: Stress and Strain Revisited. Thus, the displacement of pendulum is a function of time as shown above. so the motion of the pendulum is a function of time. Why does it hurt more if your hand is snapped with a ruler than with a loose spring, even if the displacement of each system is equal? You are observing a simple harmonic oscillator. Identify one way you could decrease the maximum velocity of the system. (a) What is the frequency at which he bounces, given his mass plus and the mass of his equipment are 90.0 kg? (b) How much would this rope stretch to break the climber’s fall if he free-falls 2.00 m before the rope runs out of slack? Hint: Use conservation of energy. (c) Repeat both parts of this problem in the situation where twice this length of nylon rope is used. Near the top of the Citigroup Center building in New York City, there is an object with mass of on springs that have adjustable force constants. Its function is to dampen wind-driven oscillations of the building by oscillating at the same frequency as the building is being driven—the driving force is transferred to the object, which oscillates instead of the entire building. 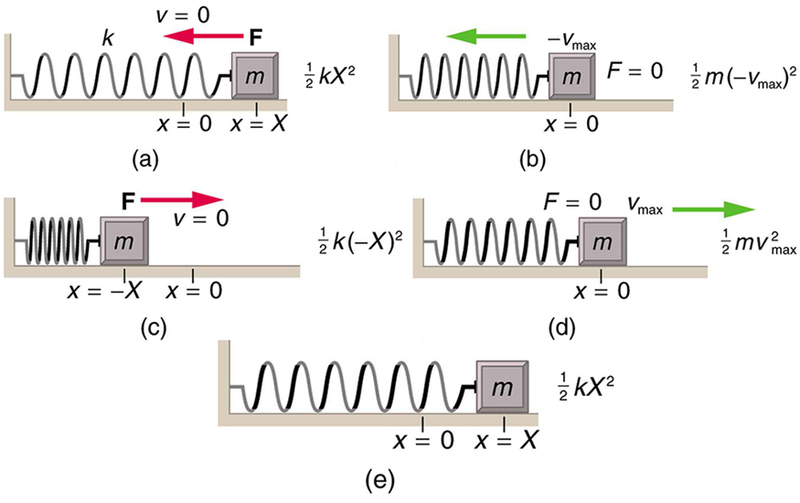 (a) What effective force constant should the springs have to make the object oscillate with a period of 2.00 s? (b) What energy is stored in the springs for a 2.00-m displacement from equilibrium? The ruler is a stiffer system, which carries greater force for the same amount of displacement. The ruler snaps your hand with greater force, which hurts more. You could increase the mass of the object that is oscillating. 16.5 Energy and the Simple Harmonic Oscillator by OpenStax is licensed under a Creative Commons Attribution 4.0 International License, except where otherwise noted.